Infrared satellite image (indicating cold cloud top temperatures) showing the location of TC Winston at 12.40pm Wednesday 17th February 2016. Tropical Cyclone (TC) Winston was named by RSMC Nadi at 1pm on February 11th, located to the east of Vanuatu. Since then, TC Winston has tracked southeast before turn northeast. Historical track (white) and forecast track (red) of TC Winston up to midnight. Image created by MetService on WeatherScape. TC Winston was located at 17.5S 172.8W north of the island of Vava’u and east northeast of Niue this morning (7am Tuesday 17th February). The central pressure of the cyclone was estimated to be 970 hPa, making it a Category 3 cyclone, and it was moving to the east northeast at about 22 km/h. Winds close to the centre of the cyclone were estimated to be around 120 km/h. Forecast track for TC Winston from RSMC Nadi’s (Fiji Meteorological Service). Over the next 24 hours TC Winston is expected to remain a category 3 tropical cyclone. The tropical cyclone is expected to continue to move northeast then it slows, before turn back on itself in a west southwest direction. Range of possible future tracks for TC Winston based on ECMWF data. Image from NOAA Earth System Research Laboratory. There are currently no direct impacts expected for New Zealand as TC Winston moves northeast and then turns westward. In the future there is chance that the track will move southerly, with most racks to the east of New Zealand. MetService meteorologists are monitoring this tropical cyclone closely and provide tropical updates daily via the Tropical Cyclone Activity page on metservice.com where you can also see hourly satellite imagery. With tropical cyclones there is always some uncertainly associated with the tracks they will take, so we advise people in New Zealand and planning travel to the Pacific to keep up to date with the latest forecasts and any severe weather warnings at http://metservice.com/warnings/severe-weather-warnings. 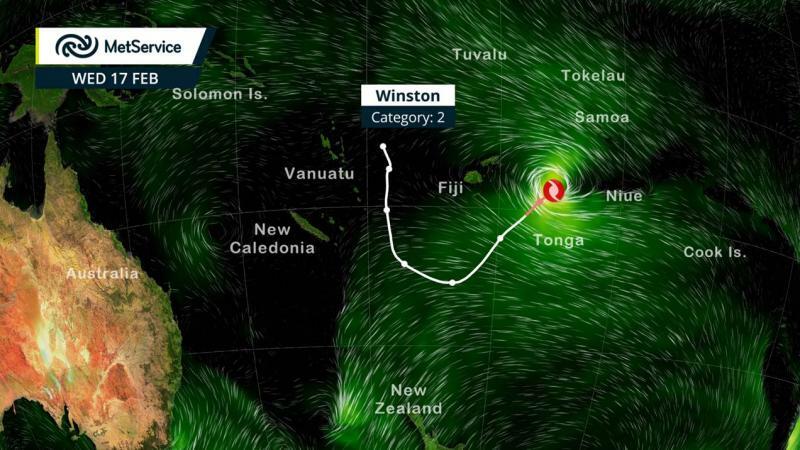 We will post further updates on TC Winston in the coming days, and as always, you can keep up to date with the latest forecasts and warnings at metservice.com. The World Meteorological Organization (WMO) Tropical Cyclone Programme has been established to help emergency managers and the public prepare for tropical cyclones and minimise the loss of life and damage they can cause. Under this programme, MetService is designated as the Wellington Tropical Cyclone Warning Centre (TCWC) south of 25S and, together with Regional Specialised Meteorological Centre (RSMC) Nadi north of 25S, is responsible for official warnings and advisories for tropical cyclones in the South Pacific. Any severe weather effect(s) for New Zealand caused by tropical cyclones will be included in Severe Weather Warnings, Watches and Outlooks, as well as marine warnings and forecasts.